It may be the most uncomfortable moment in all of mixed martial arts. 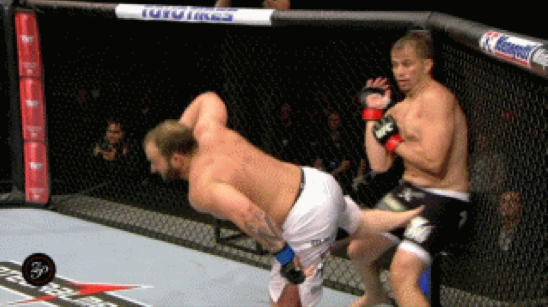 When a fighter’s kick or knee goes astray, there’s a sickly thud, and the other guy drops to the mat like he’s just taken a bullet. Yep, we’re talking about groin shots and unfortunately they happen quite often because as comedian Hal Sparks once said – "you don’t even have to have good aim, my legs will guide you in like bumper pool, it’s the worst design flaw in history." So it’s no surprise that every year we have a number of these shots landed (not to mention Joe Rogan’s raving endorsements for a steel cup to prevent this horrific assault on the male body), and 2013 was no exception. At the top of this unfortunate list for such a dubious honor stands Brazilian Fabio Maldonado, who fell victim to not only the worst groin shot of the year, but what may be the worst one of all time. In an age where Vitor Belfort and Edson Barboza are launching picture perfect spinning back kicks that land flush to an opponent’s head, it doesn’t work quite as well when a fighter like Roger Hollet attempts the same spinning back kick with all of the dexterity possessed by Abe Vigoda and his foot launches straight into Maldonado’s mommy and daddy button. Sure enough Maldanodo reacted as if his light switch had just been shut off as he fell to the ground in obvious pain, writhing on the floor in agony and wondering if he’d be singing soprano for the next few weeks. As bad as the kick was that landed on Maldonado, the miraculous thing that happened next was even greater as the Brazilian slugger somehow found the testicular fortitude to get back to his feet, continued on in the fight and managed to get the win! Kudos to you Fabio Maldonado - you probably didn’t walk straight for a few days but at least you got the win so your black and blue misery was comforted by the celebration of victory. Bobby Green vs. James Krause - There’s still controversy swirling about this final groin shot, but there’s no mistaking the first two cracks that Krause took to his family jewels courtesy of opponent Bobby Green. The last one was ruled a body kick, the fight stopped and Green declared the winner. As I can attest, however, as I was sitting all of five feet away from the Octagon that night, the crack of Green’s foot certainly made a thunderous sound akin to bone hitting plastic and it left me cringing in my seat. Mark Hunt vs. Antonio ‘Bigfoot’ Silva - This fight may go down as the greatest in UFC heavyweight history and both Hunt and Silva took a massive amount of damage over the course of their 25 minute battle. At one point during the fight, Hunt connected flush to Silva’s groin to which the big man responded ‘that was in my balls!’ and Hunt quickly came back with ‘sorry, sorry’. This is all in the midst of the battle mind you. No real break in the action, no stoppage needed, and then they kept going for a few more rounds. Nerves of steel. Luke Rockhold vs. the San Jose Earthquakes mascot - Luke Rockhold got the chance to kick a ball in a soccer goal at the San Jose Earthquakes game, and it was the team’s mascot that unfortunately took the brunt of his bad aim. Rockhold uncorked a rocket that landed with surgical precision right in the mascot’s naughty bits and I assure you costume or not that poor guy was feeling it the next day.